Thanksgiving is my favorite holiday. It’s possible this has always been true—though Halloween may have slightly edged it out when I was young—as I can recall gleefully cleaning up our house as a child, dressed as a pilgrim, something I certainly didn’t care to do the other 364 days of the year (cleaning the house). As an adult, I’ve had the pleasure of spending every Thanksgiving for over a decade with my closest friends in Portland, a second family. The funny thing is that for someone who loved Thanksgiving, I was never one for turkey. I suppose this isn’t the strangest sentiment, as the ubiquitous bird often leaves the oven dry and bland, and even well-executed roast turkey is not the most inspired of meats. 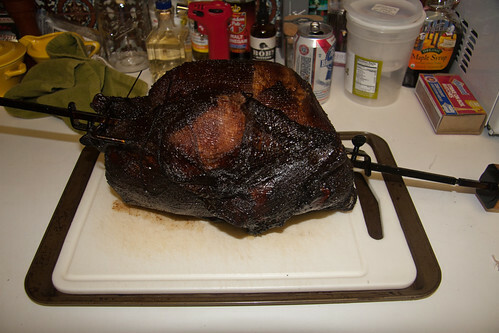 Ten years ago my best friend and I decided to attempt to make the Thanksgiving bird a bit more interesting by applying a little smoke, some whiskey, some honey and some butter. Over the years, as our Portland Thanksgiving celebration grew in numbers and technical sophistication, we got progressively better at turning out a delicious and flavorful smoked bird. This year, for the first time in over a decade, I celebrated Thanksgiving away from Portland, and hence away from the smoker I had become so accustomed to using. 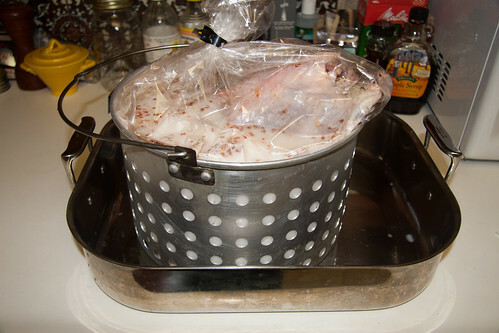 My original turkey plan this year was to cook a 14-or-so pound heritage breed turkey, a first for me. Shortly after placing an order for a 12-15 pound Narragansett from Mary’s in Sanger, CA, I learned that the only birds still available were in the 7-12 pound range. After a bit of scrambling to find another source for a properly sized heritage bird, I remembered that two is often better than one, and revised my order to two of the smaller birds. 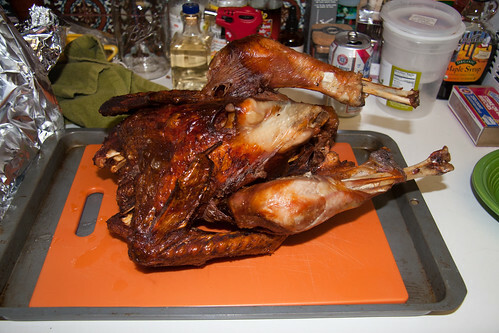 One of the turkeys was destined for my Weber rotisserie, and, by popular demand, the second one would be deep fried. The turkey preparation method we settled on after many years of experimentation is to brine the bird for about 24 hours in a preparation of salt, whiskey, maple syrup and water, topped off with a shot of a peaty single malt Scotch. This year, after some wrangling with overly creative brining setups, I placed turkey #1 in the garage, in an iced brine bath about 25 hours before it was scheduled for the rotisserie. Later that day, I prepped turkey #2 with a buttermilk brine, a mixture of salt, buttermilk, water and crushed red pepper flakes. All the best fried chicken I’ve had has soaked in buttermilk ahead of time, and I figured that turkey would benefit as well. 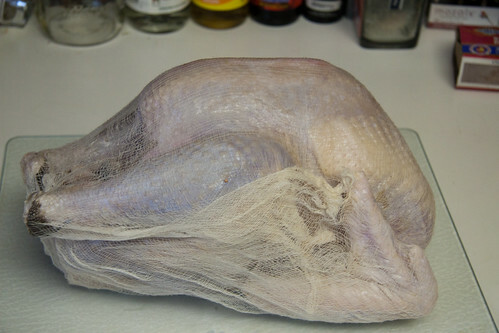 On Thanksgiving Day, around half time of the highly disappointing Packers/Lions match, I pulled turkey #1 from its brine and covered it in cheesecloth. The cheesecloth, a trick we began using a few years back, is a fantastic way to keep baste on the bird for extra juiciness. It also came especially recommended for heritage birds, like the Narragansett, because their smaller breasts are at risk of drying out. 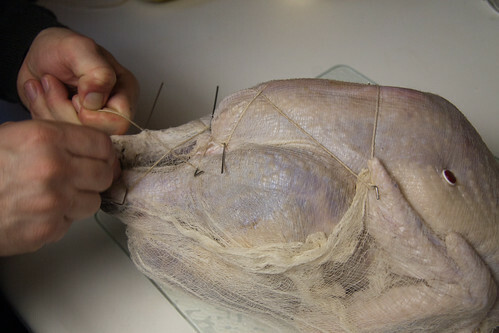 Next I pinned the wings and legs and laced up the bird to create as tight a bundle as I could. 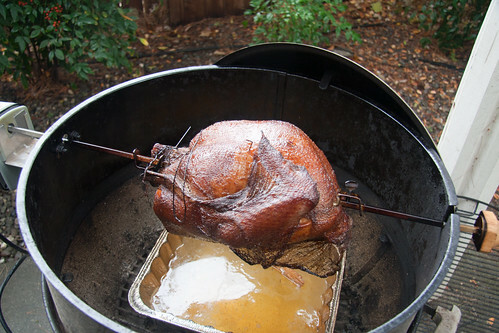 Finally, I speared the turkey on the rotisserie’s spit and set it up over a pan of water and a mix of mesquite and pecan hardwoods. Every hour or so, I basted the turning bird with a mixture of whiskey, honey, and butter and added a few more chunks of wood to keep the fire going. 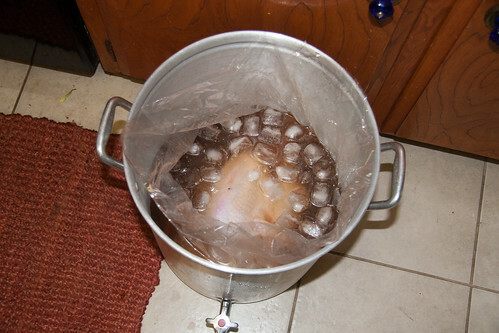 Much later in the day, I pulled turkey #2 and lowered it into a vat of hot peanut oil. This was my first time deep frying a turkey, and I was a little incredulous about the 33.5 minute cooking time that the recipe called for. Sure enough the bird cooked right up, so quickly I didn’t have time to photograph it and play host to our dinner guests. 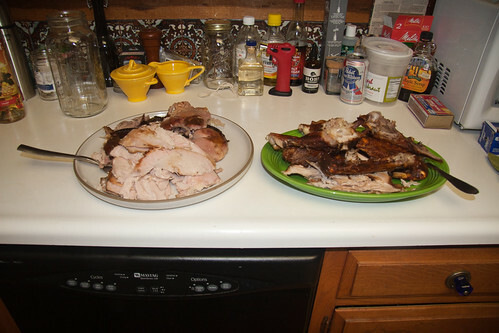 About seven hours after I started the grill, and two hours after I began heating the deep fryer, I had two very different birds ready for carving. While disassembling the turkeys, I noticed what to me is the most striking difference between the Narragansett and the traditional Broad-breasted White. I’d read that heritage bird’s had smaller breasts, relative to the rest of their bodies, but since both my turkeys were already much smaller than the turkeys I was used to, it was hard for me to judge this. Far more obvious were the upper wing, which was a distinct appendage with muscle and definition and shaped like a large chicken drumstick. These birds had real wings, not the vestigial T-Rex flappers that you find on the over-plumped turkeys. Twice while serving people at the dinner table I grabbed the wing thinking it was a drumstick before noticing the white meat. 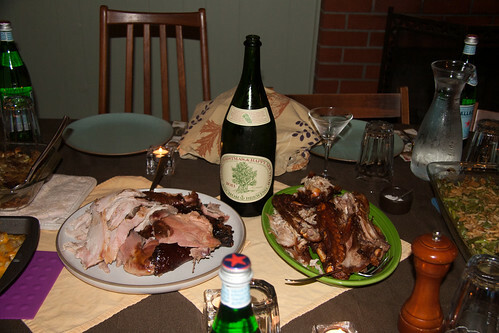 I carved the birds and piled the meat onto a pair of platters, then laid them on the center of the table, flanking a Magnum of Anchor Christmas Ale, a tradition from our Portland Thanksgivings that I was very happy to bring to Davis. Frying the turkey made for amazing skin, but the meat, while moist, was not as flavorful as I have come to enjoy. The rotisserie bird had absolutely delicious moist and slightly sweet meat, with a wonderful smokiness—bacon bird is what I aim for—but the skin, as always, suffers in the slow cooking process and never gets crisp. 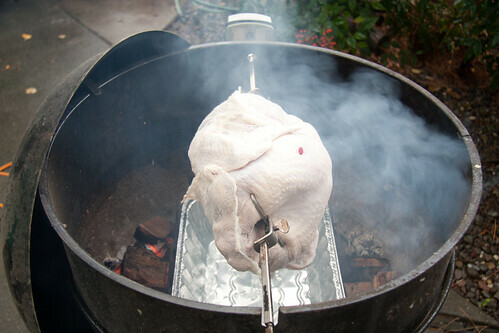 Next year I may try rotisserie or smoking the turkey about halfway, then deep frying it to finish. Hopefully that will deliver the super flavorful meat and delicious crispy skin. If nothing else, finishing the process in the deep fryer will make it very easy to get the bird to the table on time, something that I have yet to perfect in 10 years. As Thanksgivings go, this one was bittersweet; it’s tough to leave a tradition that’s been in place for much of my adult life. Luckily, our table was filled with great food and surrounded by a new crop of great people. And great turkeys, plural. All the photos are here.